Do Indian Students Still Prefer the USA? A recent visit to a study abroad fair in Kochi, India was an eye opener for me. First shock was out of the 50 or so vendors, all were recruitment centers. Very few, if any, were actual overseas college with representatives from abroad. The second shock was the wide variety of countries and academic programs showcased. No longer is engineering, computer science or medicine the main pull factors to study abroad. Management studies abroad have been on the rise among Indian students over the past few years. This is especially true as more and more MBA programs are springing up all over India and to gain ‘credibility’ they pair themselves with a college abroad to create ‘twinning programs’ (first year in India, second abroad where the degree is granted). Besides these subjects; nursing, social work, graphic design, hotel management, cooking (chef studies) and other arts, humanities and creative degrees seem to be advertised heavily. It is also important to note out of the fifty or so vendors, less than half heavily advertised placements in America. Countries such as the UK, Australia, New Zealand and Canada were no surprises, while other countries like China, Malaysia, Singapore, Germany, Ireland, Finland, Norway, Sweden, Czech Republic, Mauritius, France and other European nations also were represented. Though many Indians may long for the American Dream, many opt for a cheaper way out that continues to deliver a quality education. As more colleges in the US limit funding and scholarships to Indian students; many Indians entering American colleges as undergrads and grads alike have taken the big burden on their head of student loans. They want to assure they will be able to pay these loans back. Since the US economy has weakened, and finding jobs after graduation is not so easy anymore, we are seeing Indians return to India not out of want at times, but need. Without a job in the US, they must return to India and repay these debts from rupee salaries. 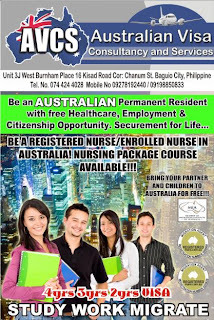 This is not a good situation for many, so they get lured by the programs that promise “Study, Work, Migrate.” Ads, like this one from the Philippines shown in this article are common in India and seen almost everyday I step outside the house in Kochi. There are a subset of younger Indians who want to use Study Abroad not to permanently move abroad (as their previous generations did), but as a stepping stone to get a good education, access to better facilities and rack up experience to come home and work and live in India. This means, that choosing a destination that is either offering more scholarships or charges less fees allows this freedom to come back home to India with no strings attached is certainly an attractive option. There are many families in India that already have at least one if not more than one relative living, studying or settled in the USA. Having heard a lot about the US, or even having had visited there has taken away the mystery of it. Some younger Indians want to explore territories not yet so popular among Indians. Keeping some of these factors in mind, it is more easily understood why the numbers of Indians coming to study in the USA have reduced by 1% or about 1,000 students between 2009-2010 academic years according to recent Open Doors Surveys. Though the numbers have reduced, Indians without a doubt will still continue to come to America. One way to assure success and overcome the hurdle of unemployment is to be prepared cross-culturally before even leaving India for the US. Understanding the mindset and culture from an insider perspective can help you get a leg up on really understanding how to get good grades, interact and make friends, and the most important aspects of how to network and gain skills for career development. If you’d like to know more about this cross-cultural pre-departure program, click here. Also for those already in the USA, this seminar is also helpful for you or you can choose to work with me one to one on career clarification and development from day one of your landing in the US so you’re not scrambling at the last minute to be employer-ready. **Author of the post and blog owner has no ties to the ad or company showcased in this post. The ad is for demonstration purposes only. Click the ad to see a bigger size. Author, Jennifer Kumar is a cross-cultural coach specializing in helping Indians adjust to American culture.